Holo Holo Charters is a pretty diverse boat tour operation. They are professional and offer a range of tour options with their fleet of boats. For an action experience, the rigid inflatable is a perfect choice. Choose the sail or power catamaran for a more calm, relaxing cruise. This is another operation that has been around for quite awhile. Holo Holo offers charters to Napali and Niihau. The only setback for taking this tour is the long drive from Princeville to Port Allen. Give yourself at least 1.5 hours for the drive. 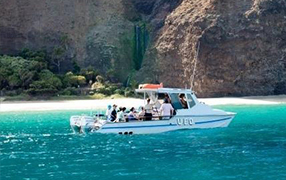 This is a long running Napali boat tour operation departing conveniently from Hanalei Bay. The captain runs a well organized program. Getting to the boat is half the fun. Some of the benefits of departing from Hanalei is the 15 minute drive to reach the boat from Princeville and the fact that Napali is just around the corner once you are on the boat. The one less exciting aspect of departing from Hanalei for some is the return which tends to be bumpier. As boats go, UFO is well suited for the waves because it has a twin hull making it a bit less bouncy and bumpy than single hull boats. 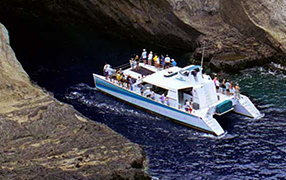 Captain Andy’s is one of the longest running boat tour companies on the island. They have a solid reputation and have put together a nice program. The biggest hurdle for tours departing from Port Allen is making the drive to the opposite end of the island. It is about 1.5 hours from Princeville – without traffic. CaptainAndy’s offers a variety of boat tours. 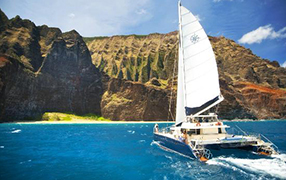 For those wanting a more calm, relaxed ride when experiencing Napali, choose the large catamaran tours. If a little wave action and sea-spray over the bow are desired, go for one of the raft adventure tours.